yaḥ (m/N/sg) – who paṭhet (opt/3/sg of paṭh) – read aloud, recite, rehearse; teach, mention; repeat to one's self, study, learn from; prasanna – clear, bright, pure, distinct, plain, just, propitiated, pleased, delighted, content, gracious or kind to; dhīmān (N/sg) – intelligent, wise, learned, sensible; devyām (f/A/sg) – divine dignity or power; bhakti – devotion; samanvitaḥ (m/N/sg) – completely possessed of, fully endowed with, possessing, full of. sāyam – evening; vā – or; prātar – early, in the morning; utthāya (abs) – having risen; smaret (opt/3/sg) – remember, recollect, call to mind; sarva – whole, entire, all, every; abhaya – free from fear or danger, safe; pradam – giving, uttering, causing. Will be endowed with complete freedom from fear. A practitioner who recites the praise in the evening and at dawn, recalling Tārā’s qualities with pure devotion, and has the wisdom to discriminate between good and bad will be protected from the sixteen fears. Others will be endowed with complete freedom from all fears. It is also said that we must meditate on her wrathful form in the evening to pacify the harms of this life, and visualize her peaceful form at dawn and recite the praises to save ourselves from rebirth in the lower realms. sarva – whole, entire, all, every; pāpa – bad, wicked, evil sin, harm, trouble; praśamanam – tranquillizing, suppressing, healing, securing; durgati – ill condition, misery, poverty, evil fate, lower realm; nāśam – loss, ruin, destruction, death. Causing destruction to all lower realms. abhiṣiktaḥ – sprinkled, anointed, installed, enthroned, initiated; bhavet (opt/3/sg) – become, be, rise, appear, happen, occur, exist; tūrṇam – quick, swift; saptabhiḥ (I/pl) – seven; jina (m) – victor, a Buddha; koṭibhiḥ (I/pl) – [the highest number]; asmin (L/sg) – this, this here; mahattvam – (moral) greatness; āpadya (abs) – to come, walk near, approach; saḥ – he; ante (L/sg) – end; bauddha – relating or belonging to Buddha, Buddhist; padam – step, pace, stride, footstep, vestige, mark, footing, stand-point, place. spot, position, station, office, (high) rank; prajeta – (opt/3/sg) be born (again) arise. Will quickly grant them empowerment. To the stage of Buddhahood. The daily practice of the Twenty-One Praises to Tārā will cause all of the practitioner’s sins to be pacified and purified. Those who recite the praise will not experience the sufferings of the lower realms. The seven million Victorious Ones who abide with the Noble Lady will swiftly bless and empower the practitioners. In this life, the practitioners of this praise will achieve the great bliss of place, body, retinue, and the qualities of the dharma of transmitted precepts and realization. They will swiftly attain the paths and bhūmis, and reach the ultimate state of enlightenment. viṣam – poison, venom, anything actively pernicious; tasya (G/sg) – he; mahāghoram – most horrible sthāvaram – standing, immovable, firm, constant, vegetable, [m] mountain, [n] immovable property; vā – or; atha – then, now; therefore; vâtha – [= atha vā] or, or rather, but, however, or if, even; jaṅgamam – moving, locomotive [opposed to stationary, sthāvara or sthira]; [note: immovable poison = poison of plants, moving poison = poison of animals]; smaraṇāt (Ab/sg) – remembrance, memory, tradition; pralayam – dissolution, destruction, esp. of the universe; yāti – go, travel, march, set out, depart, fly, escape, pass, vanish, perish; go off, speed, succeed; proceed; khāditam – eaten, devoured pītam – drunk, sucked, sipped; eva – so, even so; certainly, really; even, just, exactly, [emphasizing the prec. word]. At the conventional level, practitioners will be protected from terrible diseases, and the pain caused by aconite and other inanimate poisons. They will be protected from the poisonous fangs, horns, stings and bites of animals. The practice will also provide protection from the poisonous effect of the evil intentions of malignant spirits, protection from their touch, and the evil eye. By remembering the goddess and her mantra, the harmful effect of poisons whether they have been eaten or drunk will be nullified. graha – grasping, seizing; jvara – fever, pain, grief, sorrow; viṣam – poison, venom, anything actively pernicious; ārtīnām (G/pl) – having an object, industrious, eager; wanting, poor, desirous of, begging, a beggar or petitioner, amorous, wooing, a wooer, suitor; parama – extreme, last, chief, highest, primary, best, most excellent, worst; vināśānām (G/pl) – utter loss, annihilation, perdition, destruction, decay, death, removal; anyeṣām (G/pl) – another, other, else, different; ca – and, also, even, just, but, yet, if; eva – so, even so; certainly, really; even, just, exactly, [emphasizing the prec. word]; sattvānām (G/pl) – being, existence, reality, nature, character. Even if done for the sake of other beings. The practice can easily eliminate the suffering inflicted by outer and inner poisons, by dangerous epidemics and possession by evil spirits. The same benefit can be achieved if the praise is recited for the sake other beings. dvi – two; tri – three; sapta – seven; abhivarttinām (G/pl) – move or turn towards, repeat. putra (m) – son; kāmaḥ – wish, desire, longing for; love, inclination, lust, pleasure; labhet (opt/3/sg) – catch, seize, meet with, find, obtain, get, receive; dhana – booty, wealth, property, money; sarva – whole, entire, all, every; avāpnoti – to reach, attain, obtain, gain, get; na – not, no; vighnaiḥ – (m) breaker, destroyer, (n) obstacle, hindrance; pratihanyate (pass) – to be beaten back. And the desire for wealth can be achieved. We must recite the praise twice, three and seven times in one session. We can do the practice either two sessions a day: once during the day, and once during the night, or three sessions during the day and three sessions at night. The Vajra holders of India and Tibet teach that if one practices the sādhana of “The Four Mandala Offerings1” in this way, the desire to have children to continue one’s family line, or to provide students to uphold the dharma lineage will be fulfilled. In the same way, if one wishes to have wealth for the happiness of this life and the next, excellent prosperity can easily be achieved. 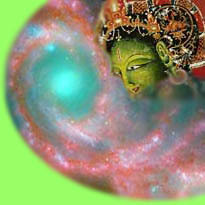 Likewise, any other activities: siddhis2, temporal desires and ultimate wishes will be fulfilled. By the compassion of the Venerable Mother, unfavorable obstacles in the future will not manifest, and harm will not arise from obstacles that have already occurred. Since all purposes can be fully achieved, the wise must practice this sādhana with enthusiasm. By the unchanging bliss, endowed with all supreme attributes. To summarize the text, the meaning of the root mantra is shown in the form of praise. The twenty-one verses of homage show the twenty-one manifestations of the goddess. 1 maṇḍala skt offering ~ A Tantric practice in which all precious things are offered to the deities, Buddhas and Bodhisattvas in order to develop generosity, the first of the six perfections. 2 siddhi skt ~ Spiritual accomplishments which may be mundane or supramundane. Buddhahood is the ultimate siddhi, mundane siddhis include clairvoyance, clairaudience, flying, etc.